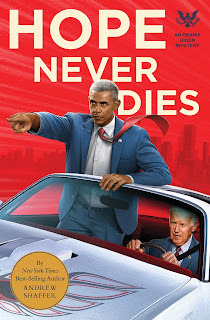 Hope Never Dies: An Obama Biden Mystery by Andrew Shaffer. I don't remember exactly where I first saw this book announced, but I immediately put it on hold at the library (digital copy). The copy came in and I hadn't had a chance to download it when I went to my folks' house for a weekend. To my vast amusement, my mom handed me the physical copy of the book almost as I walked in the door. I read it over the couple of days I was there. This book was exactly what I expected. I wanted something funny, goofy with a little bit of sincerity and the joy of the Obama/Biden memes. It hit every note, sometimes a little louder than anticipated, but always consistent. I enjoyed it thoroughly. This is not high art. Don't expect anything particularly political, either. This is a book about friendship and trains. As such, it works in ways I didn't expect to see. Some serious issues are addressed, but they are touched upon lightly. My main criticism, which is hardly worth mentioning, is that the events couldn't possibly happen the way they did. There are some shenanigans involving the Secret Service that were slightly unfair to those men. If you can suspend your disbelief, though - and think of it as a really extended Obama/Biden meme - it still manages to work. Favorite scene: Biker bar (SPOILERS ROT-13) jura Bonzn ragref naq gur ovxref nyy fgbc naq erfcrpg uvz, fnlvat "ur'f gur thl jub tbg Ova Ynqra". V whfg nobhg fcvg bhg zl qevax, naq V jnfa'g qevaxvat ng gur gvzr. (SPOILERS) I also like Biden's reaction to that particular situation - indignation followed by a little whiff of gratitude. Biden, who is the narrator of the story, comes across as a very nice man who is trying his best to handle retirement from an extremely stressful job, only he's a wee bit jealous of his younger former running mate who is running around with lots of celebrities. The book takes the concept of Obama and Biden's friendship to a whole new level - making it seem like they were best friends in office and not just politicians with similar goals. Lastly, this is a FAST read. I got through it in two days while doing lots of other things. It has short chapters, an interesting plot, numerous twists and likable main characters. Definitely worth a read IF you already enjoy the Obama/Biden memes. If you don't - well, life's short but it's a fun little book. I'll give it four out of five starfish, with the caveat that it's definitely not something everyone is going to enjoy.